Whatever commercial natural stone floor cleaning Bristol you have got to do, remember this little rule: Am I doing this the correct way with the correct products for the type of natural stone floor. We can help you and we can save your commercial natural stone floor type also. Contact us if you are thinking about DIY commercial natural stone floor cleaning Bristol, we wont put you off the idea and we will give you some tips. 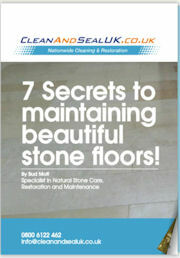 The Correct Commercial Natural Stone Floor Cleaning Service For your Floor Type. With so many types of different natural stone floors laid throughout the UK you might think that one certain way cleans ALL, sorry but you would be wrong. Its so easy to make this mistake so contact CleanAndSeaUK for all your commercial natural stone floor cleaning Bristol services as we know the correct method for each natural stone type. Sealing commercial natural stone floor tiles. Are you looking to have your commercial natural stone floor tiles cleaned and sealed then contact CleanAndSealUK, we offer you a great cleaning and sealing service designed for your natural stone floor. Contact us regarding your commercial natural stone sealant requirements, we will be more than happy to discuss sealing natural stone with you.